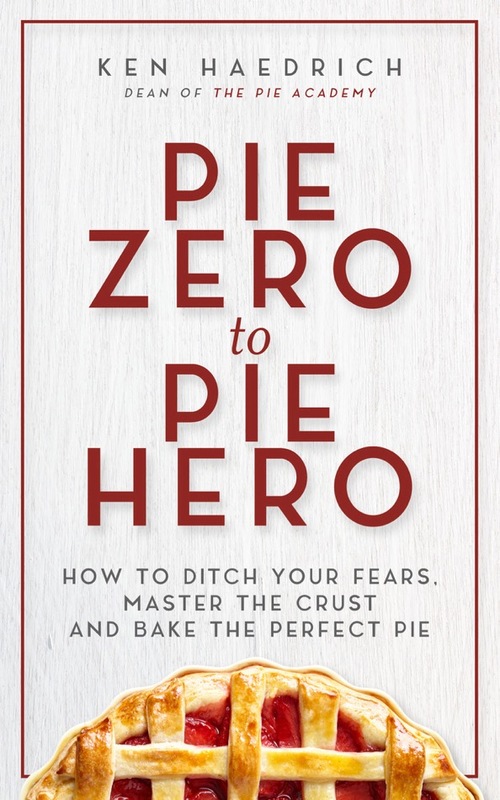 I never tire of quiche – eating it, trying new recipes and techniques, and serving it to appreciative house guests at the holidays, when all smart cooks are looking for dishes that don’t require us to putter, hover, or stick to a hard and fast meal timetable. Quiche is just the ticket. 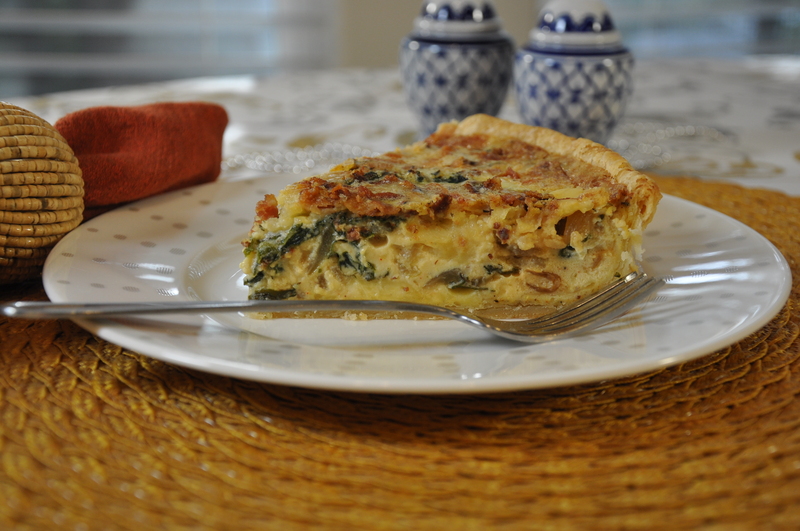 Of course, there’s always the issue of what to put IN your quiche – a delicious dilemma if there ever was one. Let me give you a tip, gleaned from the front lines of quiche making for many years now: bacon. Our vegetarian friends notwithstanding, if you put bacon in it, they’ll eat it. Bacon is to quiche what George Clooney is to the box office: a guaranteed draw. Beyond bacon, let’s consider the custard. In a word, it should be rich. 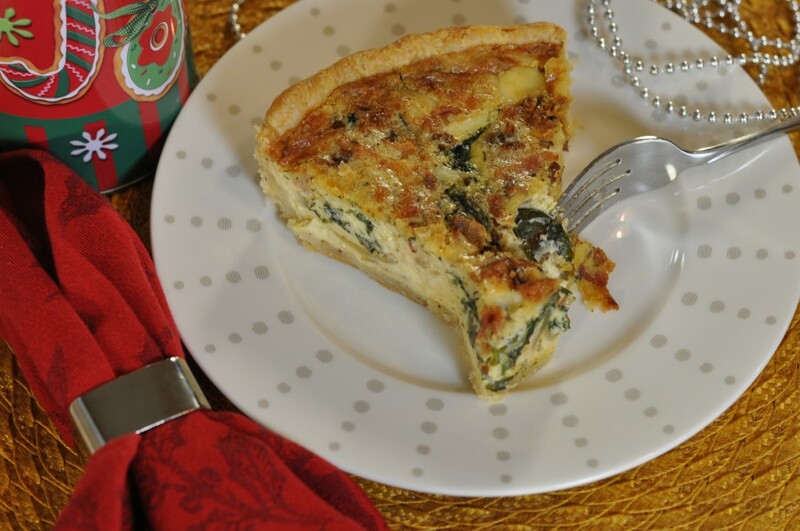 Quiche – especially around the holidays – is not meant to be a lesson in dietary restraint or correctness. Rather, a good quiche is a champion of the dairy industry and no recipe worth its salt (we’ll get to that in a moment) contains the words lowfat, skim, or canola. Indeed, our Swiss chard quiche incorporates both heavy cream and sour cream, 5 large eggs, butter, and a goodly amount of Havarti cheese. You need only be concerned about your heart if you have no plans to share this quiche with 8 to 10 family members or friends, as intended. 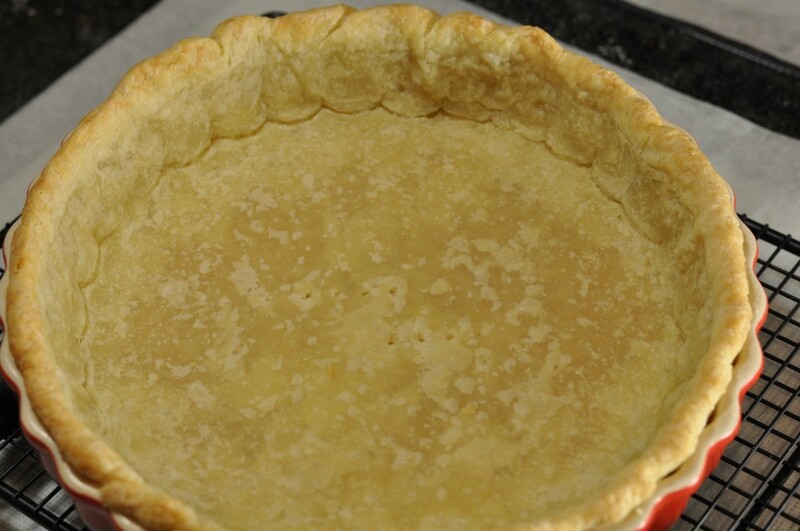 Concerning the custard, I don’t always use it, but I find that a bit of flour in the custard does make for a nice “tight” filling – one with a certain textural compactness that yields good clean cuts. In case you’re wondering, there’s no residual floury taste or texture, so no need to be concerned about that. All this richness does benefit from a strategic pairing with sauteed onions and something green. Broccoli is fine, if a bit predictable. I adore sauteed brussels sprouts, though the number of their constituents is never certain. So I like to go leafy: sauteed Swiss chard. Spinach is fine, too. Both add color, texture, contrast, and interest. I mentioned salt earlier, so let me include a brief admonition to not not skimp. A dense, rich custard will taste flat without enough of it. Especially if the quiche is served lukewarm, at room temperature, or even cold, as it often is. My pastry? For quiche, I like to use an all butter crust like the one here. And yes, I always prebake it so the bottom crust doesn’t get all soggy – an absolute buzz kill where quiche is concerned. 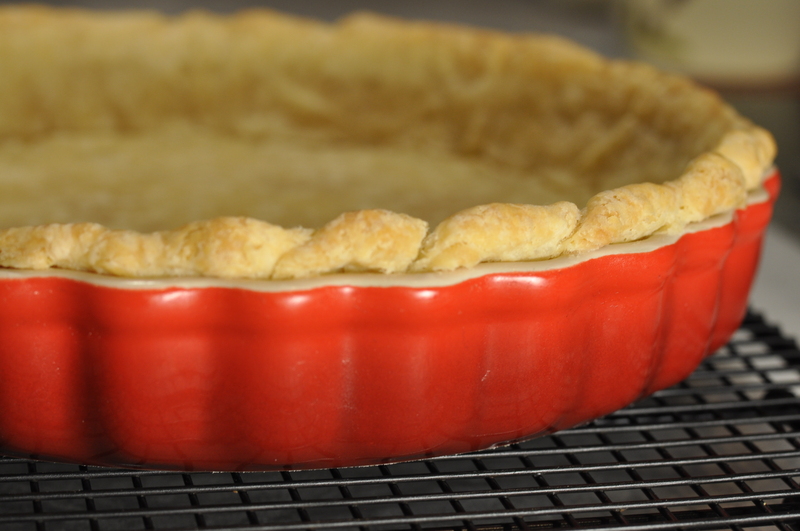 Feel free to use any of the pie doughs that I’ve recommended in the past, but if you’re game to try a good all-butter crust, consider the one here. I’ve incorporated a couple of little tweaks that will help keep the dough from shrinking too much – a common prebaking issue. These include the addition of a little cake flour and cider vinegar, to help tenderize the dough. Longer resting times for the dough as it chills. And a slightly different procedure for the baking itself. I’m still tinkering with this method myself, so if you do follow my cues, let me know how it works out for you. These two photos below will give you some idea that this method has worked out pretty well for me: the first shows that the crease in the bottom of the pan has pretty much stayed intact and not shrunk or rounded off as often happens when prebaking. And the sides of the pastry – which I usually sculpt-and-pinch up above the sides of the pan, to hold more filling – have not sunk. I should have, however, continued to bake the pastry until it was a bit more golden brown all over. This amount of time this will take depends, in part, on what type of pan you end up using – ceramic or metal. Let me sign off by saying that I hope your holidays are shaping up wonderfully, with plenty of good food, family, and festivities on tap for the weeks ahead. Please take as much time as possible to enjoy the season and spread plenty of good cheer. And accept my heartfelt thanks for being part of The Pie Academy. If you haven't already, line your quiche pan with the dough and prebake according to the directions. Set aside to cool. Preheat the oven to 375°. Preheat a large, heavy skillet and add the bacon. Cook until crisp, then transfer the bacon to paper towels. Cool. Pour off all but about 2 tablespoons of the bacon fat and put the skillet back on the heat. Add the 2 tablespoons butter and the onions. Cook over moderate heat for about 10 to 12 minutes, until the onions are light golden. Stir in the Swiss chard; salt lightly. Cook, stirring often, until the chard is wilted and tender, about 5 minutes. Remove the skillet from the heat. 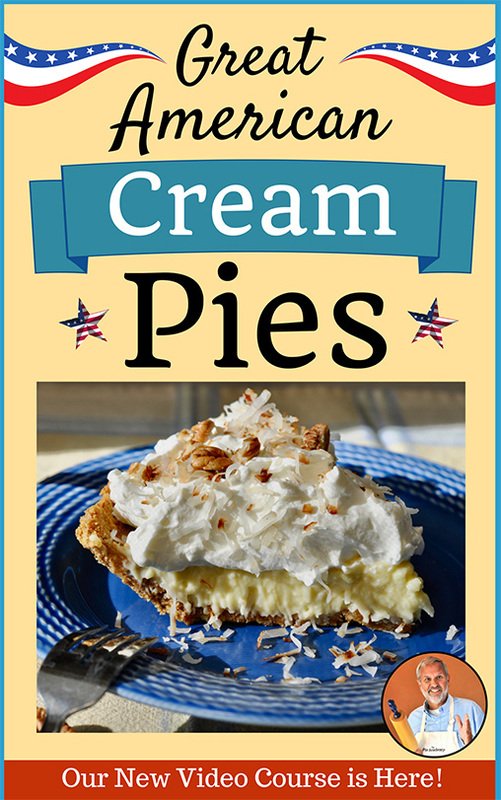 Whisk the sour cream and milk in a large mixing bowl. Add the flour and whisk until smooth. Whisk in the eggs, one at a time, until evenly blended. Whisk in the salt, heavy cream, mustard, thyme, pepper, and paprika. Set aside. To assemble the quiche, sprinkle 1/3 of the cheese over the bottom of the shell. Distribute the chard and onions evenly over it. Sprinkle with another 1/3 of the cheese. Whisk the custard briefly, then slowly ladle the custard over the chard and cheese. Crumble the bacon and sprinkle it on top along with the remaining 1/3 of cheese. 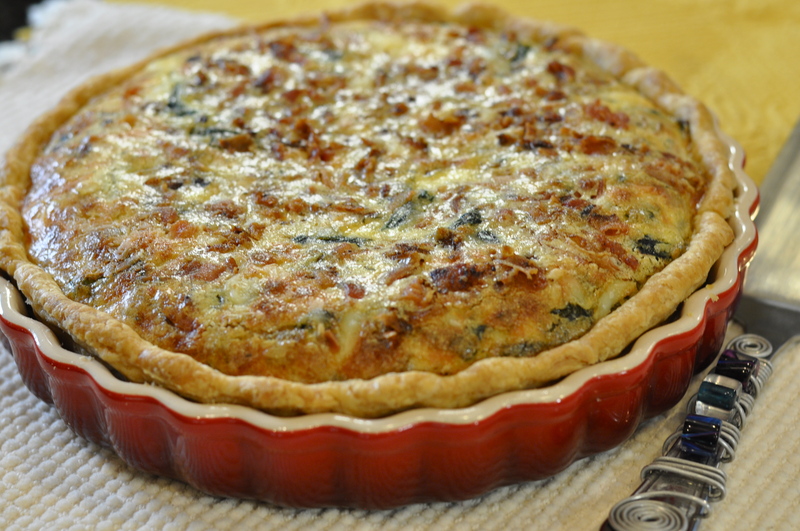 Transfer the quiche to a cooling rack and cool at least 20 to 30 minutes before serving. Cool completely, then cover and refrigerate any leftovers. Makes 8 to 10 servings. Combine the flours and salt in the bowl of a food processor. Pulse several times, to mix. Remove the lid and scatter the butter over the flour. Replace lid and give the mixture 5 or 6 one-second bursts - just enough to break up the fat into large, pea-size pieces. Pour the vinegar into 1-cup glass measuring cup. Add just enough ice cold water to equal 1/3 cup. Add the water through the feed tube in one continuous, 7- to 8-second stream, pulsing the machine as you add it. Once the water is added, pulse just long enough for the dough to form large, clumpy crumbs; it should not ball up around the blade. Dump these clumpy crumbs out onto your work counter and pack them into a ball. 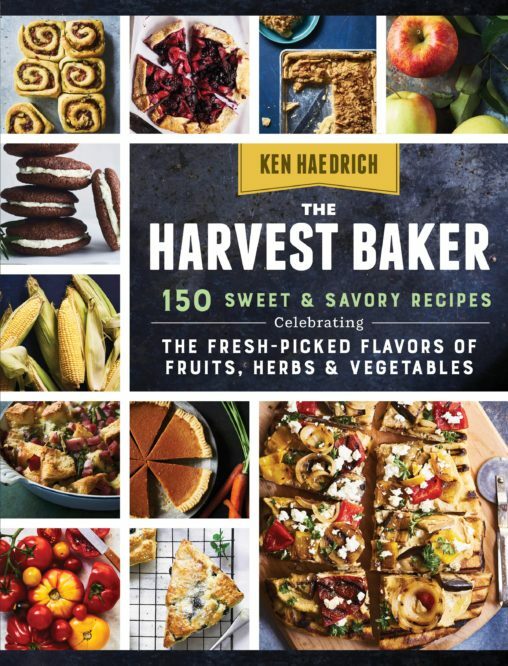 Knead twice, then flour the dough and flatten it into a 1-inch thick disk. Place the floured disk in a gallon plastic freezer bag, then roll the dough - right in the bag - into a 7-inch diameter disk. Seal the bag and refrigerate for 2 to 3 hours before rolling. 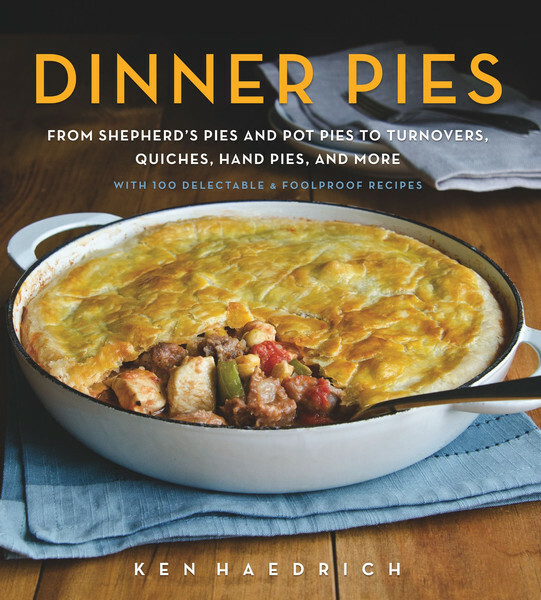 Makes enough pastry for one large pie or quiche shell. 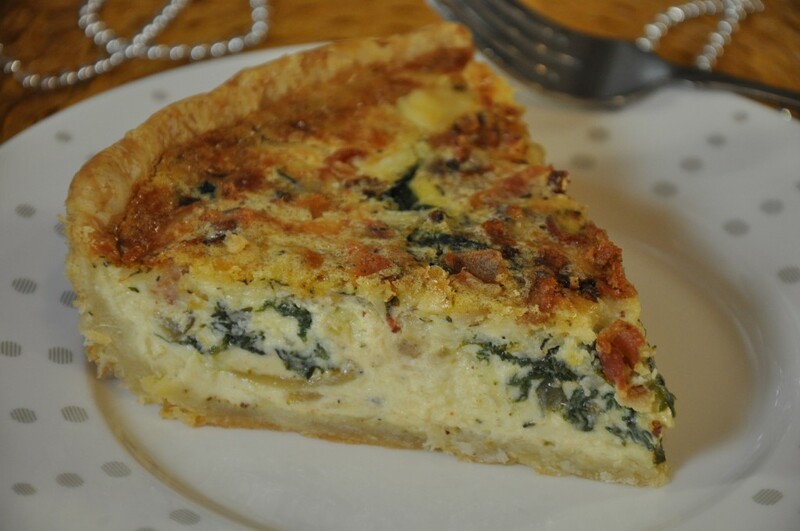 TO PREBAKE YOUR QUICHE SHELL - Remove the dough from the refrigerator and let it sit for 5 minutes. Remove from the bag and flour lightly. Place the dough on a sheet of lightly-floured wax paper and roll it into a 13-inch circle. Invert the pastry over a 9- to 9 1/2-inch tart pan, center it, then peel off the paper. Lift the edge of the dough with one hand while you tuck it snugly it into the pan with the other. Fold the excess dough back and pinch/sculpt the edge so it's slightly higher than the sides of the pan. If the dough is too thick in places, you can trim it with scissors. Refrigerate the tart shell for at least 1 hour. To prebake the shell, preheat the oven to 375°. Tear off a sheet of aluminum foil 14- to 16 inches long and tuck it into the shell so it fits like a glove; you should be able to see the crease in the bottom. Fill the foil shell with dried beans, banking them up the sides to hold them in place. Bake on the center oven rack for 35 to 40 minutes, until the visible edge is light golden brown. Remove the shell from the oven and place it on a cooling rack; leave the oven on and do not remove the foil and beans quite yet. Reduce the heat to 350°.